This article details of some of the essential tools you should have in your toolkit if you want to construct electronic circuits. The most essential tool is of course the soldering iron, so later in this article there is some guidance on choosing one and some tips on how to master the techniques of soldering. As their name suggests, side cutters have blades placed at one side so that they can be used to easily and neatly crop the ends off component leads after the components have been soldered to a piece of stripboard or a Printed Circuit Board (PCB). Be careful when using this tool as the lead off-cuts fly off relatively fast and might hit you. 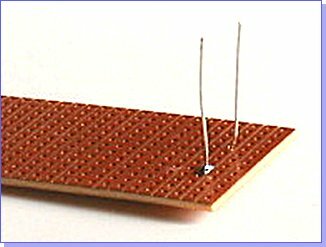 You will most likely be using thin equipment wire (single core or stranded) when connecting off-board components to the stripboard or PCB, or when constructing a prototype circuit on breadboard. Wire strippers like those shown can be easily adjusted to make stripping the insulation off these types of wire simple. An inexpensive low wattage soldering iron is all that is required for electronics. It is worth paying a little extra for a model that has a silicone-insulated cable fitted. This will prevent you accidentally melting the mains cable. All soldering irons have removable bits so that you can fit the most appropriate size bit for the job - a 4mm bit is fine for normal work with stripboard or PCBs. A soldering iron can heat up to around 400ºC, so you should always place it in a soldering iron stand when it is not in use. Using a stand keeps your soldering iron within easy reach and most also incorporate a sponge (which should be wetted with water) with which to clean the bit. A handy tool to have when soldering is a desoldering pump, or 'solder sucker', which is used to remove excess solder from a joint. When the plunger is fully pushed in, it latches. Heat the solder to be removed using a soldering iron, and place the tip of the desoldering pump on the solder. Press the button on the desoldering pump and the plunger will spring back, drawing in the molten solder. Solder can be purchased in small dispensers like the one shown below right, but is also available on larger reels. An optimal solder for electronics would be 22swg tin/copper (all solder is now lead-free). 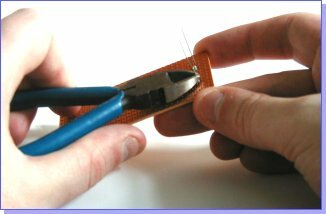 The solder should include a flux core which, when it melts, cleans the component leads and stripboard or PCB tracks being soldered. When soldering, take care not to breath in the poisonous fumes from the solder. After handling solder, always wash your hands. When you first use a new soldering iron, or fit a new bit to one, you first need to 'tin' the bit with solder. To do this, simply hold the solder against the soldering iron bit as the iron heats up. The solder will eventually melt onto the bit. Wipe off the excess solder on the wet sponge that is part of your soldering iron stand. The bit has now been 'tinned' and is ready for use. To solder a wire or component lead to a circuit board track (be it stripboard or a PCB), push the lead through the hole in the board (from the component side) allowing at least 5mm of the lead to protrude. Place the tip of the soldering iron at an angle against both the track and the lead and allow both to heat up. Feed the solder in around the track and you should find that it runs all the way around the track and the lead (see picture 1). If this does not happen, the track and the lead are not hot enough. To stimulate heat transfer, you can let a small amount of solder melt onto the soldering iron bit. Allow only enough solder to complete the joint - too little and there will be a visible weak spot, too much and there will be a solder 'blob' and you risk the solder splashing onto other tracks and causing a short circuit later on. When the soldering iron is removed, the solder joint should look shiny and should be in a pyramid shape (picture 2). A dull-looking joint is called a 'dry joint' and while it may look fine, could be mechanically weaker. If you have a dry joint, or you have used too much solder in the joint, that is the time to use your solder sucker and start the joint again! Remove the excess lead using a pair of side cutters - don't try to use other types of cutters since you may accidentally rip the copper track away from the board..
To joins two wires together, first 'tin' them by placing the soldering iron tip on each wire and letting solder melt onto each one (figure 3). You can then easily join the two by bringing them together and heating briefly with the soldering iron. The solder will flow evenly along the exposed parts of the wire creating a strong bond (figure 4). Most components can be soldered directly to a board without sustaining any heat damage. However, components such as integrated circuits (ICs, or microchips) and transistors will most likely be damaged by the heat produced during soldering. Integrated circuits should never be soldered directly onto a board - always solder in an IC holder and do not insert the IC into it until all soldering on the board is complete. Transistors and other small components must be soldered directly to the board, so the only away to avoid heat damage is to divert the heat away from the component. Attach a small crocodile clip or tweezers to each lead before it is soldered. This 'heat shunt' will absorb the heat created during soldering. Even so, you should only apply the soldering iron for as long as it takes to create the joint. When joining wires to larger off-board components, it is common to put heat-shrinkable sleeving around the joint. This gives the joint extra mechanical strength and stops stray strands of wire shorting with any adjacent component contacts. Heat-shrink sleeving comes in various lengths and diameters which can then be cut to the required length. Use a hair dryer to shrink the sleeving after applying it.